Although they aren't quite as popular as big-name brands like Singer and Bernina, Elna sewing machines have had a devoted following for decades. Famous for their reliability and ease of use, these Swiss sewing machines have been sold in the United States since the 1940s. You can find vintage models for sale in antique shops and flea markets, and modern Elna machines are available from a number of retailers. Like many specialty brands, you'll have to visit an approved Elna retailer to purchase a machine. You can use Elna's Dealer Locator to find every authorized retailer in your local area. New models are not sold online. Like many other manufacturers, Elna understands the value of making models for seamstresses with varying needs and experience levels. You can purchase a simple, inexpensive machine that's perfect for a beginner or a top-of-the-line model with all the extra features an experienced seamstress might desire. Each model has its own pros and cons. Designed for the beginner, the Elna Sew Fun is a mechanical machine that can produce 15 different stitches. At about $200, it's affordable enough to make a great child's sewing machine or a first machine for someone just dabbling in a new hobby. The quality and number of stitches are impressive, and this machine is designed to be easy to thread and use. It features an integrated light for sewing, a carrying handle, a number of accessories, and a cover. According to PatternReview, a site that reviews sewing machines and patterns, there are a few things about the Elna Sew Fun that don't stack up to the competition. One problem is the speed control. Although the speed is supposed to be variable, it is difficult to get this machine to go slowly enough for a beginner to feel comfortable. Repositioning the needle for a narrow seam allowance also posed a problem. Another mechanical option is the Elna eXplore 320. This basic machine features 21 stitches and a 4-step buttonhole. It's easy to thread and wind the bobbin, and it comes with a number of accessories and a handy compartment to store them in. At about $300 to $450, this machine is affordable for most seamstresses. 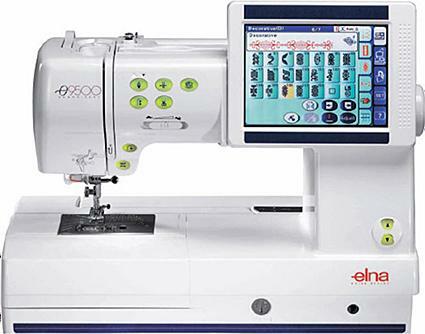 PatternReview praises the Elna 320 for its ease of use, particularly when it comes to selecting stitches and changing the tension on the machine. The stitch quality is superior to more expensive machines from other brands. It's also very easy to change bobbins. Marketed toward sewing artists and those who want to add an extra creative touch to their quilting and sewing projects, the Elna eXcellence 740 offers a number of attractive features. Most notably, the long arm design is great for machine quilters or those who regularly sew bulky projects like slipcovers. It comes pre-set with 245 different stitches and 11 different single-step buttonhole designs. This machine also comes with numerous feet and accessories, which store in a handy compartment on the front of the machine. With a manufacturer's suggested retail price of almost $4000, the Elna 740 is expensive even for quilting-capable machines. The seamstresses on PatternReview praise the machine's quality and its ability to stitch all types and weights of fabric. The automatic thread cutter and versatility in accepting attachments and bobbins designed for other machines also placed this near the head of the pack. Generally, the consensus is that this is a great machine but that it is somewhat over-priced. If you're looking for a machine that can perform your daily sewing tasks and also embellish your projects with beautiful embroidery, the Elna 8600 may be an excellent option. This machine comes pre-programmed with 107 different types of stitches, including multiple options for sewing buttonholes. You can also choose from three different alphabets to embroider messages or monograms on your work. It comes with hoops for embroidery, extra feet for many sewing applications, and a number of other helpful accessories. It also features an easy-to-read LCD screen. At $2400, the price of this machine is one disadvantage. However, users on Product Review gave the Elna 8600 4.3 out of 5 stars, citing its ability to easily embroider large designs and still handle a range of fabrics, from delicate chiffon to heavy-duty denim. One complaint is that the machine uses PC card slots to transfer embroidery designs, rather than the more modern choice of a USB cable. Since Elna has been selling sewing machines to US consumers for more than 70 years, you can also find antique and vintage models. Ebay is a great online source for used modern Elna machines, as well as vintage and antique options. You'll also find these sewing machines at antique shops, flea markets, and even thrift stores. Elna 1 - Produced from 1940 to 1952, this machine is affectionately known as the "grasshopper" because of its green color. Lotus - The Lotus, which was produced from 1969 to 1980, had distinctive protective flaps that opened up to reveal the machine or closed to create an integrated case. Zigzag - Produced in various forms from 1956 to 1977, the Zigzag was notable for its ability to produce both straight stitches and zigzag stitches. Should You Buy an Elna? In general, the lower priced Elna machines are still more expensive than the competition, but reviewers maintain that they produce a superior stitch quality. Higher-end models make great quilting or embroidery machines but are still expensive for many consumers. If you're considering an Elna sewing machine, examine the features on each particular model and determine whether the brand name and stitch quality are worth the extra money for you.